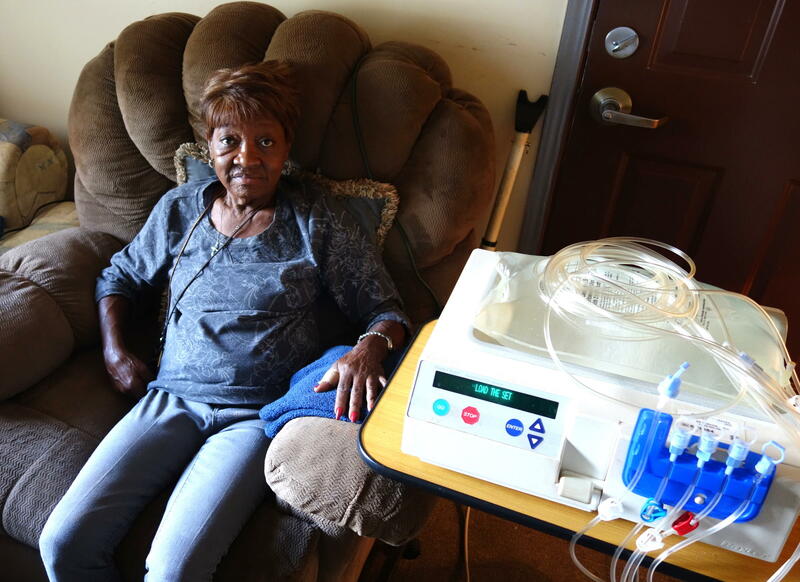 Anne Hickman, 74, uses peritoneal dialysis at home while she sleeps. Peritoneal dialysis fluid is pumped through a catheter connected to Hickman's abdomen. 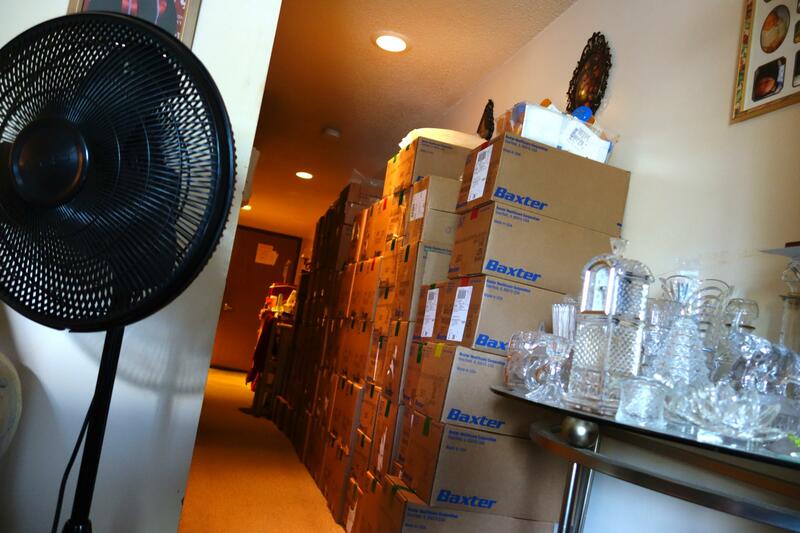 Boxes of peritoneal dialysis fluid take up room in Anne Hickman's one-bedroom Indianapolis apartment. “I got damn near 40 boxes sitting in the hall,” she says. Hickman, 74, says it’s worth the tight squeeze because the boxes hold the fluid she uses for peritoneal dialysis, or PD. While she sleeps, a machine pumps the fluid into her abdomen. The process removes toxins from her blood, a function her kidneys performed before she was diagnosed with end-stage renal disease. When she was faced with the decision to start dialysis last year, Hickman was wary of standard hemodialysis. Hemodialysis patients travel to a clinic three times a week and spend hours there while a machine filters their blood. Hickman had seen the effects of hemodialysis on her neighbors and worried about the restrictive diet, the fatigue and the nausea that can accompany treatment. “You're weak, you're hungry, you're tired — you're sick,” she says. Hickman’s doctors gave her a choice between hemodialysis and peritoneal dialysis. Hickman chose PD, which is unusual. Only 10 percent of new patients with end-stage renal disease started peritoneal dialysis in 2015, according to the most recent United States Renal Data Service report. That’s striking: PD patients like Hickman have more freedom, and they actually tend to live longer. The therapy isn’t appropriate for everyone, but the USRDS report shows that adjusted survival rates are consistently higher for patients on peritoneal dialysis. But Dr. Steven Guest, author of a clinical guidebook on PD and a medical director with Baxter, a medical company that makes dialysis supplies, says studies have shown that more patients would choose PD over hemodialysis if they’re given enough information. “When you fairly and thoroughly educate patients on PD, up to 40 percent — sometimes even higher — would choose PD if they were really educated,” he says. PD patients can travel and keep a day job, and their diet is less restrictive than it is for hemodialysis patients. “Patients are just frankly not being told about a home dialysis option,” says Guest. Guest says that goes back to incentives. In the 1980s and 1990s, many people were concerned that PD was riskier, and Guest says Medicare reimbursement favored standard hemodialysis. A whole industry sprang up around hemodialysis because that’s where the money was. “They needed to fill the chairs,” he says. As PD usage declined, Guest says doctors weren’t trained in it. “They may not have confidence prescribing it or even talking to patients about it,” he says. Guest argues that if more patients were on peritoneal dialysis their quality of life would improve and taxpayers would save money. Kidney failure is an expensive problem in the U.S. because Medicare picks up most of the cost: nearly $34 billion in 2015, the most recent year available. “Dialysis patients are 1 percent of Medicare population, but consuming 7 percent of the Medicare budget,” Guest says. A year of treatmentfor a patient on hemodialysis costs $88,750, compared to $75,140 for a peritoneal dialysis patient — a 15 percent difference. And Guest says peritoneal dialysis saves on transportation costs that hemodialysis patients incur going to the clinic. For these reasons, he says, many other countries have “PD first” policies. “They did not want to repeat the errors they saw here in the U.S.,” he says. The number of people on peritoneal dialysis in the U.S. started to climb in 2007, and in 2011, Medicare altered it’s reimbursement. Dialysis clinics now have a bigger financial incentive to have patients on PD, according to Dr. Dinesh Chatoth, associate medical director with Fresenius Medical Care. “We know that financial incentives and reimbursement incentives can drive growth,” Chatoth says. Fresenius Medical Care and DaVita, the two largest dialysis providers in the U.S., have started to prioritize home-based dialysis options, which include peritoneal dialysis and home hemodialysis. Dr. Martin Schreiber, a chief medical officer at DaVita, says that barriers still exist among doctors, many of whom operate independently of dialysis clinics. 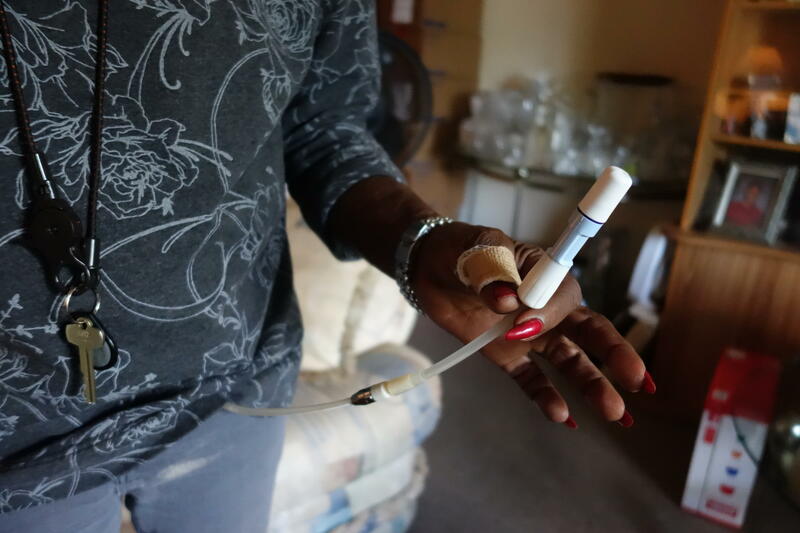 Dr. Melissa Anderson, a kidney doctor in Indianapolis, says physicians may have a financial interest in hemodialysis, as well, because doctors still make more money from hemo. She says doctors can see many patients in a short amount of time. “Your billing and reimbursement is significantly higher,” she says. That might encourage doctors to keep patients on hemodialysis when peritoneal dialysis might be a better option, Anderson says. Patients themselves can also be a barrier. Many people are unfamiliar with peritoneal dialysis, and they may be hesitant to start PD if they’ve grown accustomed to hemodialysis. Anderson and other experts say new patients may choose PD over hemo if they’re told about it soon enough. Anne Hickman says she’s lucky her doctors gave her enough information to choose peritoneal dialysis.